Earlier this month, Elon Musk published “Master Plan Part 2”. Part press-release, part-manifesto, it outlined the future for Tesla. And it captured our collective imagination in a way no other CEO or company can. Musk is a special breed of CEO. He lacks the salesmanship of Jobs, he lacks the ruthlessness of Kalanick, he lacks the youth of Zuckerberg. And yet, in a tech industry which profits mostly from advertising, transaction fees, and rakes on labour, Musk has found a way to forge his own path: his companies succeed by actually building things. Solar panels. Space ships. Electric cars. Every day hundreds of thousands of completely empty trucks roam European roads. Even if the truck owner has managed to find some load to be carried, there's still an average of 1/3 of spare space in the truck. At the same time producers and merchants struggle finding an optimal truck to carry their load to the destination. In every link of the chain massive amount of manual work is carried out to get the job done. Calling and emailing your way to get a suitable match is akin to finding the needle in a haystack. 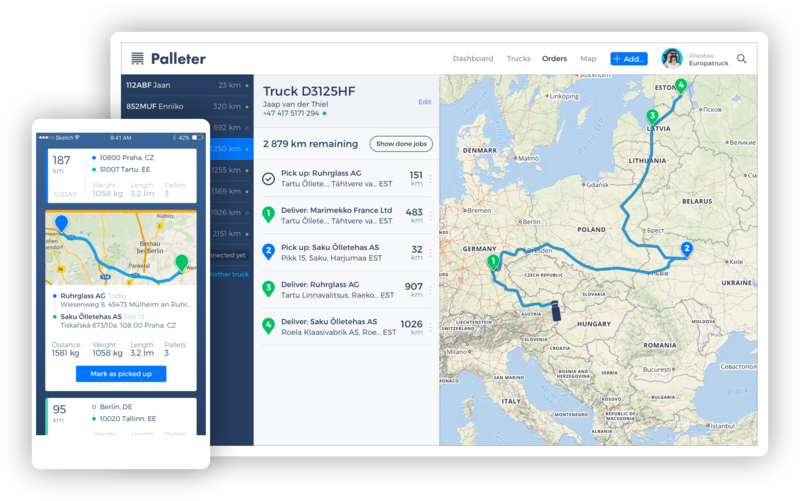 Palleter simplifies life for everyone in the trucking business.